Not liking this at all. To be fair, I love that it’s reflective but the pattern on this is not at all to my liking. I also don’t like running jackets with hoods that flap when you run. This jacket came in this Alarm stripy pattern, A citron stripy pattern (nicest of all I guess) and I think it was a coal and black stripy pattern. 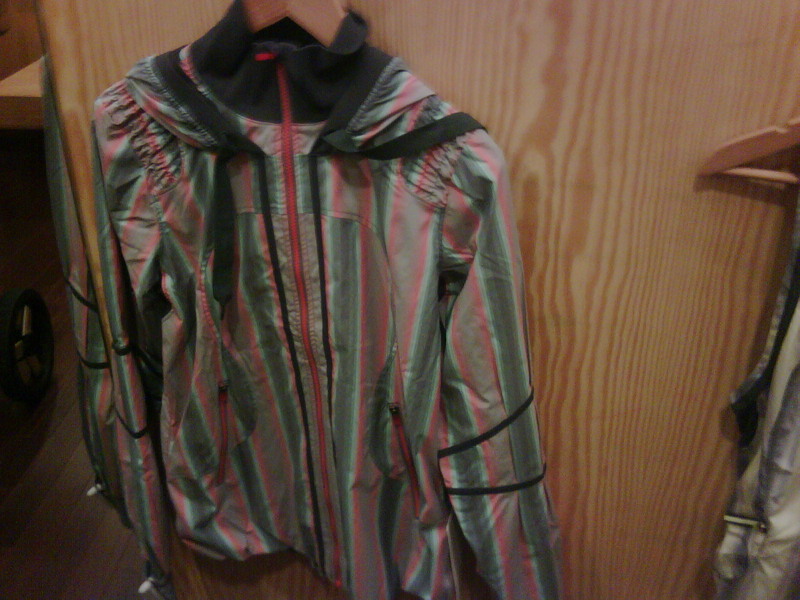 I think I’m sticking to my Running Room, purely utilitarian jacket for running. My Running Room jacket is thin and light where as this one felt pretty heavy on the hanger. "New Products: Run Reflection Vest"
this is the Track n Field jacket. The track and field jacket is my all time favorite Lulu jacket (I have three), but I am not loving this pattern – not very flattering. Glad to see that it will be making a comeback in the fall, though – hopefully in some better colors and patterns. I love the Track n Field jacket but yes, it is a fairly warm jacket for running.. I'm crossing my fingers that the Velocity jacket returns because that one is super lightweight and has vents all along the arm, it's fantastically designed =). Thanks Cheryl. I didn't even want to try it on, I just new it wouldn't work. The material is too thick for running for me and it felt a little heavy on the hanger. My running room jacket is light and soft considering it's a similar material and the sides open up for ventilation. Too bad it's so drab and hides all of my lulu underneath it. The Track n Field I like for street wear (not in that print) and I can see myself getting tempted by the Velocity jacket but my husband got me the Running Room jacket for my birthday which was sweet so it would be bad to get a jacket that would make me ignore the one he got me. I must be strong.